Nash Community College representatives assisted in preparing lunches for volunteers and athletes and worked in the developmental area with the tennis ball throw, bean bag throw and ball roll competition. “Several NCC students commented that they were surprised at how competitive the athletes were. I think it was a learning experience for everyone. We had a lot of fun and we are looking forward to next year. I hope we will have twice as many volunteers,” Griffin said. The season will begin again in the fall with bowling and basketball and then finish up with the Spring Games in 2020. Griffin said adult athletes often go to regional and state competitions and some even make it to the World Games for Special Olympics. Volunteers are vital to the Special Olympics. Individuals at NCC who are interested in volunteering should contact Rebecca Griffin at rwgriffin273@nashcc.edu. 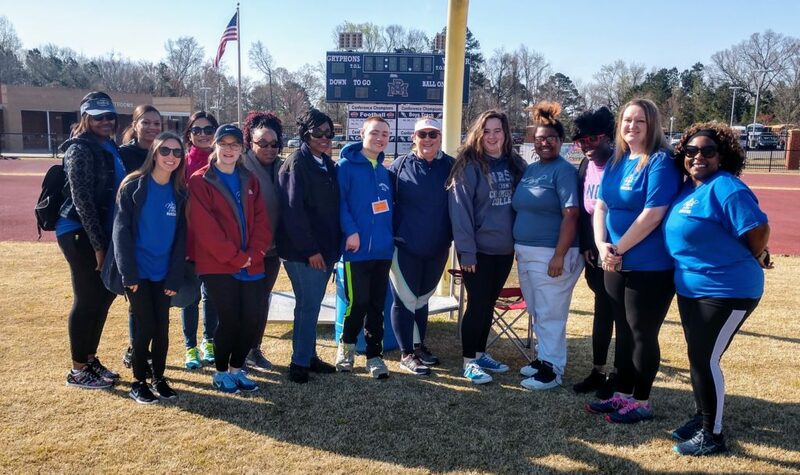 Thank you to the following NCC volunteers for their support of the Nash County Special Olympics 2019 Spring Games: Reatherbell Johnson, Camari Taylor, Isaiah Cherry, Brenda Silver, Lattisha Boddie, Haley Cone, Tiffany Best, Malieka Eatmon, Raisha Lewis, Sinai Salazar-Mariano, Anastasia Jeffers, Yafang He, Meghan Strickland, Ashona Wiggins, Kayla Sullivan, Lattisha Boddie, Zach Johnson, Tiffany Taylor, Latoya Greene, Julie Edwards, Tina Treish and Rebecca Griffin.